828 mk3 Firewire, FireWire audio interface from MOTU in the 828 series. The MOTU 828MK3 is a firewire or a USB connected interface. The manual was easy to read through and understand making the set up process very easy. It is rackable taking up one rack stace and it also has on board effects. The support with this product is not very good though I remember having some issues when working with it on my Mac a few times and contacting them about it got me nowhere. The DSP effects are built in are a huge plus for any user, there are reverb and EQ plug ins to use with any DAW that you enjoy working in. 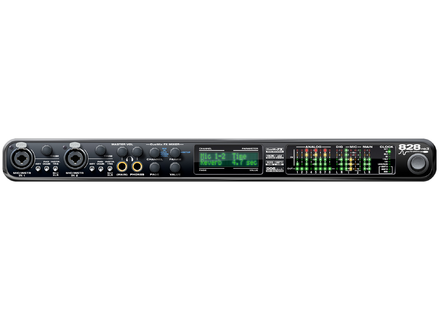 The preamps are decent, not the best that I have heard from MOTU but not the worse either. This interface will work on a Windows and Mac system and it works great with ASIO drivers as well. It comes with software called AudioDesk which I only used one time and didn’t like it at all but I guess if you are a new user then it could work for you but you will outgrow it and want to do more. It came with software called CueMix FX too, which was great! This interface does not seem to be built as well as other MOTU interfaces and it seems like it could have issues if it is used and abused. But it does come with a warranty for 2 years from them so if you have any issues you can always return it. Hopefully it is a hassle free return. There is a small LED screen that is backlit, it doesn’t have the best quality but it is not bad. It is easy to read and see what you want to do on it but it is not very graphical. This interface is average at best to me but the plug ins that comes with it makes it worth having because they are worth the money.